French maker of supercars Bugatti is celebrating the 110th anniversary of its very first auto with a special version of the Chiron Sport, limited to just 20 cars. It's not clear how much more this will run over the $3.26 million Chiron Sport, but Bugatti will only offer 20 of these, and they're likely all spoken for. Behind the alloy wheels painted in "Nocturne" matt black, the bright blue brake calipers are visible. The diffuser and bumper are finished in glossy Steel Blue Carbon. The car's colour scheme takes inspiration from the French flag, with red, white and blue applied to many areas of the vehicle. Appropriately called the Bugatti Chiron 110 Ans Bugatti, French for "110 Years of Bugatti", the hypercar is all about honoring its French heritage. Carbon-fibre has been used on the steering wheel, steering column and seat trims too. Inside, the vehicle features tricolour stripes down the headrests and backrests of the two-tone blue leather and Alcantara seats. 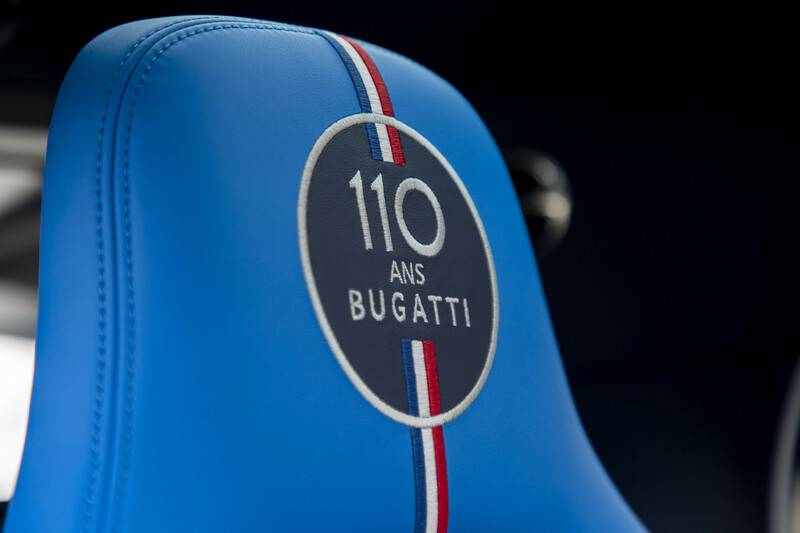 The key of the "110 ans Bugatti" is surrounded by three sewn leather patches in the colours of the tricolour. In 1909, Bugatti founder Ettore Bugatti unveiled his first ever model, the Type 10. As a finishing touch, there's a "specially crafted medallion" in the centre console storage bin, made from solid silver. It was "light, small and nimble with an adequate power output". Power (and that's a true understatement here) is as per the regular Chiron Sport, with an 8-litre, 16-cylinder, quad-turbo petrol engine pushing 1103kW and 1600Nm. That's enough to get the machine from zero to 100 km/h in under 2.4 seconds; up to 200 km/h in 6.1 seconds; and 300 in 13.1 seconds. "Molsheim in the Alsace region of France is an essential element in Bugatti's brand history and this is also where we are planning our future".